And that headline, ladies and gentlemen, describes Sweetiepips. Sweetiepips is one of my favorite jewelry shops with it’s wide range of styles and beautifully bright colors. It’s run by a very fascinating lady name Katrien, who is an awesome artist and absolutely loves what she does. It definitely shows! Fried eggs on toast anyone? Earrings that is…. I hope you’ll stop by and visit Katrien and Sweetiepips very soon. You never know what treasures you’ll find there! From Derbyshire England to right here in Houston, TX, (where we are very lucky to have her) I’m very excited to introduce you all to a very fine lady who has been an inspiration to me as well as a great leader who inspires many entrepreneurs to follow their dreams. Lindsey is at the helm of our Afternoon Tea, Chat and Treasuries Team on Etsy. She leads the way with her great ideas and always with a sense of camaraderie. It is honestly the best group or team in which I’ve ever been associated, and it is a huge credit to her and how much time and effort she puts into everything she does. Not only is Lindsey our fierce leader, she is a devoted wife, mother, and daughter. She has two businesses of her own, being both a realtor and jewelry designer, is the leader of our ATCT Team and hostesses an Afternoon Tea Luncheon/Meeting Group in Houston as well. Did I mention that she’s also an avid traveler? I believe she is what is described as a dynamo — or perhaps we should call her a Texas Tornado! I honestly do not know how she manages to do everything that she does (and do it so well). I’ll not question, just be very grateful that she is a part of our lives. I wrote to Lindsey recently to express how she has inspired me, not only in promoting my little business, but also artistically. I very much enjoy her passion for her new home here as well as the passion in which she puts into everything she does. 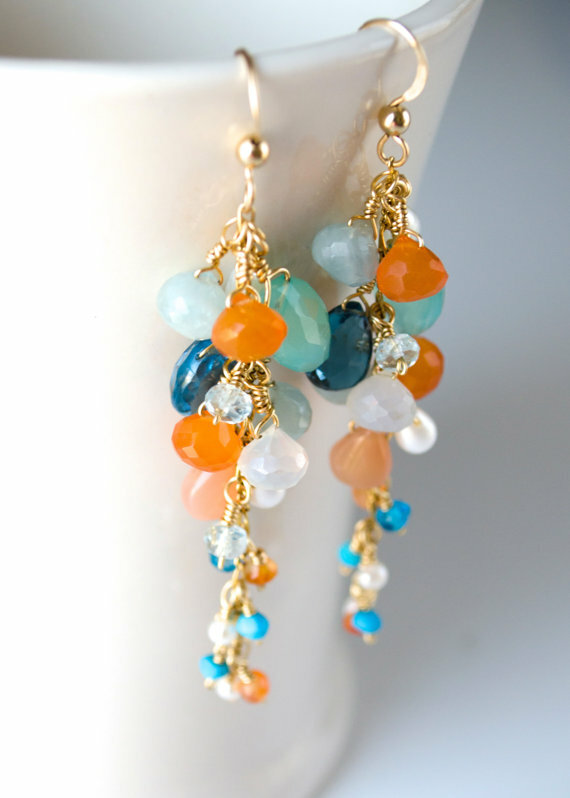 And speaking of what she does… SAjolie, her French inspired jewelry boutique is a true delight! Again, where she finds the time to produce such beautiful items is beyond me — But I will say that I think she must do more than one thing at any given time. I contacted Lindsey to inquire about custom jewelry items one evening. She was very gracious and communicated with me via her Etsy shop, sending me pictures and examples of what choices she had available, all while prepping dinner for her family. I told you she is a dynamo! Here is a picture of the custom key ring that I commissioned from Lindsey. It came out so stunningly beautiful and arrived gift boxed so lovely. I was very excited to give this as a special gift. SAjolie features an eclectic fusion of Bohemian, Spiritual, Cowgirl and Charm. You can find something for all jewelry styles within the large collection of her vintage and handmade pieces. Lindsey says that she loves nothing more than a custom order. And I can certainly vouch for that! There are over 1500 items in her shop in which to happily browse, many with inspirational messages (of course! ), and something for just about any occasion you could imagine. And did I mention that the shipping is free? Believe me, when you cross paths with Lindsey, everything is a positive. I hope you have the good fortune of meeting Lindsey in some capacity, and I certainly hope that you’ll visit her online boutique for very special jewelry items to commemorate a special event or person in your life or just for something gorgeous to wear!